Historically, it is known that carrots were eaten by ancient Middle Eastern people and by the 1300s, purple and yellow carrots had spread as far as western Europe and China. For some reason, however, orange became, and still is, the preferred carrot color. Most spring-garden seed catalogues offer at least a half-dozen varieties of delicious carrots. This well-known vegetable ranges from long and slender to short and blocky. There are hybrids, heirloom, coreless, extra sweet, smoothly tapered and jumbo. Gardeners are also invited to try a rainbow blend of yellow, red and white carrots that are guaranteed "... to be an exciting mix of color and taste." Today's hybrid carrots are much sweeter than the old standards, (now called heirlooms), I grew up hating. As a child I could not eat those bitter carrots unless they were cooked almost to mush in a stew or soup. Because of plant science, I now enjoy sweet carrots raw or cooked al dente. Carrots are a high-fiber vegetable - rich in Vitamin A and loaded with beta-carotene. They are also one of the vegetables that tastes better if pared before eating. In addition to the health benefits, they provide a deep orange splash of color to any dish - carrots are almost like confetti for the plate! 1 lb. 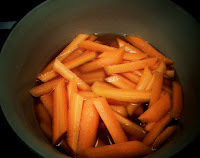 carrots, cleaned cut into 3” pieces. 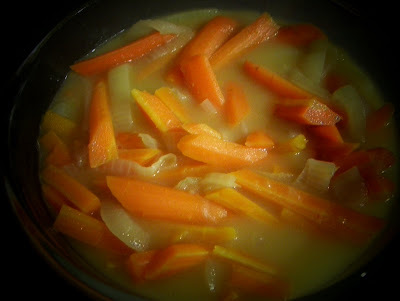 Slice pieces lengthwise into fourths and simmer in 1 can chicken broth until tender-crisp. 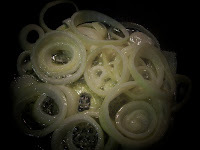 Slice onion and sauté in butter over low heat until tender. Combine with carrots and broth. Put 1 T cornstarch in ¼ cup cold water and blend well. Add mixture slowly to carrots and onions. Heat and stir until thickened. Add salt to taste. Serve immediately. *To make a prettier presentation, cut all carrot ends and pieces on the diagonal.